I’m going to refer back to Dolce & Gabbana’s delicious F/W 2014 collection several times in the next few months, I can just feel it. As an American gal with Italian parents, I fall head over heels for the Madonna-Whore vibe inherent in so many of their pieces. Religious imagery in clothing is nothing new–neither is baroque chic, which designers like Marco Bologna pulled off so well in their F/W 2012 collections. But here we have pieces–whether midi or mini length–that are more capricious in the way they fit the body. They suggest a certain amount of freedom, which is a nice contrast to the structure that religion provides in the lives of so many. But D&G is giving us so much more than just a salute to faith here. They are taking us on an adventure back in time to the twelfth-century Sicilian city of Monreale. This clothing evokes romance, whimsy, and unleashed desire. 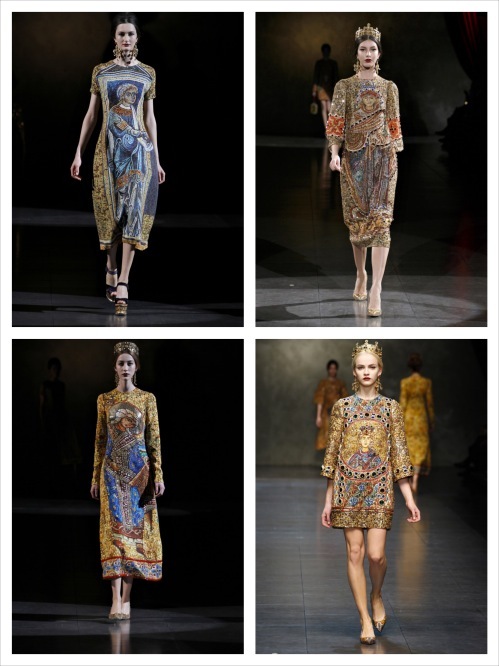 And so, I think, do these pieces–which do not mimic D&G’s collection (I mean, how could you?) but instead summon the same feelings: those that encourage us to daydream about faraway places and mystical experiences. 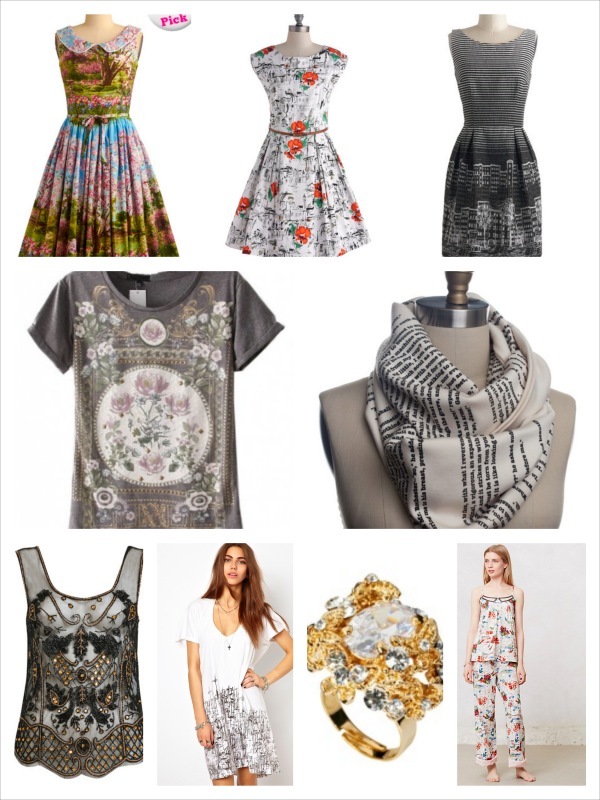 Modcloth Scenes From the City Dress, $179.99; Modcloth Scenes of the City Dress, $122.99; Modcloth Scene and Believed Dress, $139.99; Chicnova, $28.80; Etsy A Tale of Two Cities Book Scarf, $42; Baroque Embellished Tank Top, $38; Asos Religion Cradinal Cross Print T-Shirt Dress, $47.52; Talullah Tu Crystal Baroque Cocktail Ring, $27.15; Anthropologie City Perch Set, $48-$58. Reblogged this on Photograby By Akili.